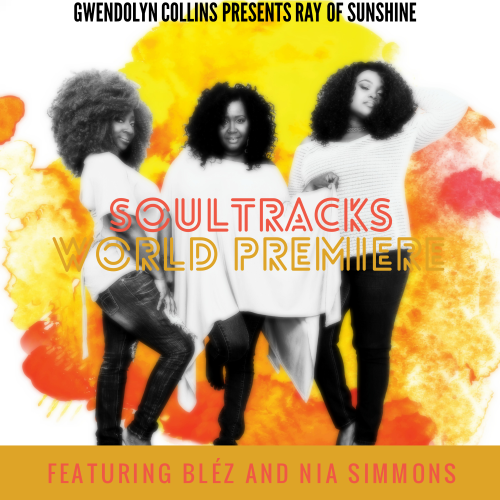 World Premiere: Gwendolyn, Nia and Blez give us a "Ray of Sunshine"
(May 8, 2017) A few years ago, we introduced SoulTrackers were introduced to talented singer and songwriter Gwendolyn Collins when we reviewed her album Storytelling Side 1: The Simple Things. It showed her to be an artist who stylistically skirted the line between soul and jazz, and who lyrically was unafraid to discuss edgy topics head on. Since then we’ve continued to follow Gwendolyn, as she’s release a series of great singles, many in collaboration with other great female singers. Now, Gwendolyn is back with another song that teams her with other great modern soul singlers. “Ray of Sunshine” is a tasty gem with Gwendolyn trading vocals with regular SoulTracks faves Bléz and Nia Simmons. It’s about finding that happy spot, even on a day that is challenging. And the arrangement behind the song is pure gold, giving a cool Summer vibe that we just love. So get ready to bask in this sunshine of this terrific new cut.